20 Litre of Premium Activated Carbon Media. This is 20 Litre of Premium Activated Carbon Media for fresh, pond and marine external filters supplied HDPE bucket with handle. Activated carbon is capable of adsorbing a wide range of organic substances, certain heavy metals and removing oxidising molecules (such as chlorine and ozone) from liquids and water. Typical applications for liquids and water purification are: The purification of water like: Aquarium and pond water (Removes heavy metals, odour, discolouration, organic contaminants and pollutants to leave aquarium water crystal clear). Groundwater (BTEX, Chlorinated solvents, PAH) Industrial wastewater (COD, AOX, EOX, TOC) Landfill leachate (COD, AOX, TOC) Municipal wastewater (Micro Pollutants) Process Water (Feed water, condensate, ultra-pure water,) Swimming pool water (chloramines) The purification of food grade ingredients and products: Brewing and bottling industry (dechlorination, taste, odour) Decaffeination of coffee and tea Edible oil and related products like fatty acids, lecithin and glycerine HVP (Hydrolised Vegetable Proteins) Scrap Candy Sweeteners (colour removal, colour stability) and many others. Several purification steps in industrial processes at petrochemical, chemical, pharmaceutical plants like the purification of: Adipic acid Amino Acids Caprolactam Contrast liquids DEA (Diethanolamine) Fumaric acid Hydrochloric acid Maleic acid Pantaerytritol Phosphoric acid Steroids Vitamins and many others. The purification of water intended for human consumption such as: Home water and appliance filters Point Of Use (POU) and Point Of Entry (POE) water treatment with in-line and through cartridge filters Municipal and industrial drinking water production for Disinfection by-products (DBP) removal (Trihalomethanes) Micro pollutants removal such as endocrine disruptors Natural organic matter removal (NOM) Pesticides and pesticide degradation products removal (Atrazine, BAM,) Taste and odour removal (Geosmin,) Effectiveness of activated carbon purification of water and liquids The effectiveness of activated carbon depends on: The nature of the organic matter to be removed. Substances with a high molecular mass and low water solubility are adsorbed better. The concentration of the substance to be removed (the loading percentage). The higher the concentration, the better the adsorption. The presence of other organic compounds, which results in competition for the available adsorption space. The parameters of the liquid (temperature, pressure, humidity, pH). This service is available upon request as a PDF file. All our products are labeled in accordance with the new European regulations for Classification, Labeling and Packaging (CLP). Ltd holds no responsibility for the applications of our products once they have left our premises. We use third party couriers to distribute our products. Whilst we do our utmost to ensure goods are delivered on time, we cannot hold any responsibility for goods once they have been dispatched. Please read our full terms & condition before purchasing any product. (An example of how we will send your parcel). For Highlands, Channel Islands and Northern Ireland. > AB31 to AB38 > AB40 to AB56 > IV1 to IV28 > IV30 to IV32 > IV36 to IV40 > IV41 to IV49 > IV51 to IV56 > IV63 > KW1 to KW17 > PA20 to PA38 > PA41 to PA49 > PA60 to PA78. > PH4 to PH44 > PH49 to PH50 > PO30 to PO41 > TR21 to TR26 > Channel Islands > Isle of Man > Isle of Wight > Northern Ireland (BT) > HS > ZE > JE > GY. This will be free of charge 24h or 48h service excluding Saturday-Sunday and Bank holidays (charges for above postcodes will be added automatically at the time of your check out). 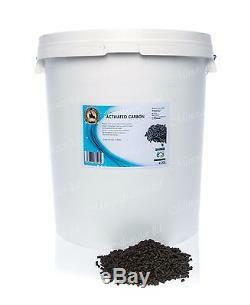 The item "20 Litre Premium Activated Carbon Media for fresh, ponds & marine external filter" is in sale since Monday, September 29, 2014. This item is in the category "Pet Supplies\Fish & Aquarium\Filters".ltd" and is located in purfleet, Essex. This item can be shipped to all countries in Europe, Australia, United States, Canada, Brazil, Japan, New Zealand, China, Israel, Hong Kong, Indonesia, Malaysia, Mexico, Singapore, South Korea, Taiwan, Thailand, Chile.